A painter witnesses angels moving on the ceiling of St. Paul’s Cathedral in London. A girl wearing a boa of dead rabbits leads a gang of dead kids on a series of misadventures across the heavens. The traditional format novel The Forever War was first published in 1974. It won the coveted Nebula, Hugo, and Locus awards. The novel became a series and was adapted into a play. 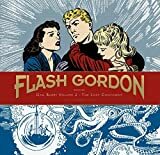 Like Batman, Spider-Man, Sherlock Holmes, and Wonder Woman, Flash Gordon has lived through several reincarnations. But his essence is always the same. Neverboy is one of the strangest comics miniseries around, but it is compellingly whimsical, sad, and hopeful.